A spokesman for Nassau County Executive Ed Mangano calls the news of the expected charges "complete rumor mill and nonsense"
A spokesman for Mangano told NBC 4 New York Wednesday that the expected charges were "complete rumor mill and nonsense"
Nassau County Executive Ed Mangano is expected to be charged as early as Thursday on federal corruption-related matters, according to sources familiar with the case. 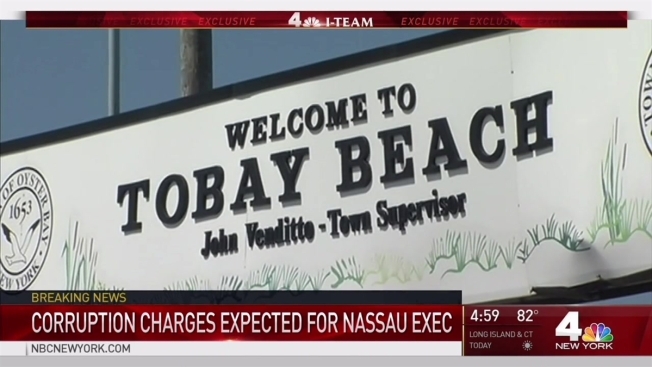 For more than a year, questions have swirled about the 54-year-old Mangano's ties to businessman Harendra Singh and whether Mangano accepted free vacations from the restaurant owner in exchange for helping him with business deals. Singh has restaurants in Bethpage and Oyster Bay, including at the town's golf course. Singh was arrested last year and has denied charges he bribed one Oyster Bay town official in exchange for getting loan guarantees. He was also accused of lying to FEMA in order improperly collect $1 million Sandy relief money. A Long Island family spoke with Greg Cergol exclusively about their fears they may be out more than the thousand dollars they deposited for an engagement party. Despite sources telling NBC 4 that Mangano is expected to appear at the federal courthouse in Central Islip Thursday, a spokesman for the Republican official, Brian Nevin, told NBC 4 New York, "County Executive Mangano has the highest integrity, has done nothing wrong, has not been contacted, and the accusations are preposterous." Spokespeople for the U.S. Attorney and the FBI declined comment, as did Singh's attorney.